"Conditional" fields offer a flexible way to define conditional text and paragraphs within your document. By utilizing a "Conditional" field, you can specify that a field's value should be determined by the value of one or more other fields. "Conditional" fields allow you to specify as many conditions as you like, set a default value if those conditions are not met, or "exclude" (remove) the field if the conditions are not met. The first step in implementing a conditional field is to identify the field (or fields) that your conditional field will depend on. If you don’t have an existing field, the simplest way to do this is to create a “single select” field with a predefined list of options. The conditions will be evaluated from #1 - #2. If the value of “Number” was “2” in this case, #1 would be executed first and the value of the conditional field would be “Less than three.” Since the #1 condition is evaluated as true first, all other conditions after it are skipped. 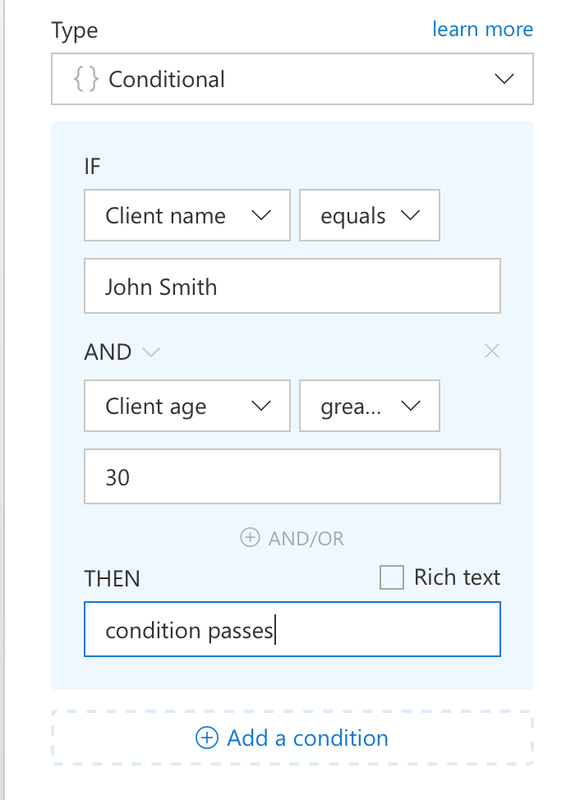 Adding additional constraints to individual conditions using "AND" & "OR"
Once you’ve defined your conditional field, you insert it into the document wherever you like just like any other field. Sit back and watch the value for your conditional field automatically change based on the values of its dependent fields. Remember, you can always edit your conditionals by adding/removing individual conditions or editing the values that the conditions evaluate to.